Recent college graduates everywhere are being initiated into the real world, and with that initiation comes all the corresponding responsibilities of adulthood. These responsibilities are new and foreign, and sometimes they can be frustrating to navigate, especially as they relate to managing your finances. Nothing is more challenging than figuring out your credit status. Credit is a layered topic with complicated implications that affect your financial future. But, if credit is so important, why is it so tough to figure out? 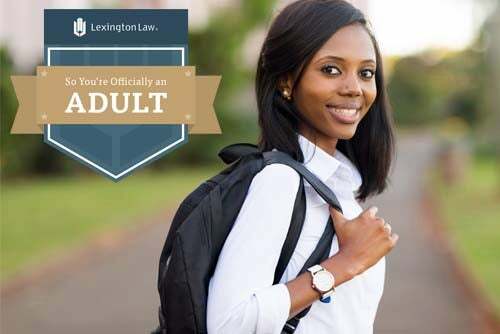 Lexington Law is here to help. Here are some things you need to know about credit that no one taught you about in school. Credit Cards are the most common form of credit. Unlike your debit card, a credit card does not have actual funds attached to it. The funds you are being credited come from the bank associated with the card, with the promise that you will pay them back on a monthly basis. Credit cards have potentially high interest rates and financial limits, which protect both you and the bank. Credit Lines –– more commonly referred to as a Line of Credit (LOC) is a limited loan from the bank. They approve a maximum amount you can borrow, but you can borrow less than that amount as needed. LOC’s are more appropriate means for making single-instance, large purchases than a credit card because there are no penalties associated with cash advances. Common uses for an LOC include home remodeling projects and auto repairs. A Personal Loan is similar to a LOC in that the funds come from the bank with the promise to pay them back over time. However, the biggest difference between an LOC and a personal loan is that the loan is typically for the exact amount that you need, and nothing less. A mortgage, or a housing loan, is an example of a personal loan. How can credit affect me? Your credit score is a summation of how well you use your credit; do you pay your borrowers back on time? Do you use more than you need? This information is reflected in your credit score. A credit score can make or break you in this brave, new (adult) world. Bad credit can prevent you from getting a job or a lease on a new apartment. Good credit can make you an attractive candidate for a mortgage when it comes time to purchase a house, or help you open a really great credit card with an amazing rewards program. In other words, knowing where you stand in the land of credit is essential to your success –– and your peace of mind. 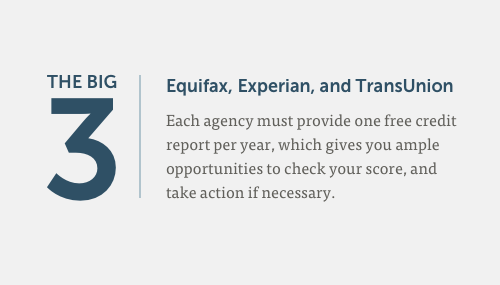 Credit scores are reported by three reporting agencies –– usually known as “The Big Three” –– Equifax, Experian, and TransUnion. Each agency must provide one free credit report per year, which gives you ample opportunities to check your score, and take action if necessary. “Credit Invisibles” are people with no history of borrowing money, and thus, no credit. New graduates without student loans in their names are often credit invisible as they have not yet opened a credit card. Opening a credit card with low interest rates can be a great way to build credit, as long as you commit to using it sparingly and paying it off right away. Having no credit is a tough place to be, but perhaps not quite as hard as having bad credit. Whether your low credit score is the result of student debt, or poor early financial habits, getting credit help really is essential to your financial future. If you are concerned about your credit score and you would like to discuss your options with an experienced professional, the experts at Lexington Law are just a click away. Be sure to check out our new app, here. This entry was posted in Credit 101 and tagged credit, Credit Repair, Credit Score, loan. Bookmark the permalink.